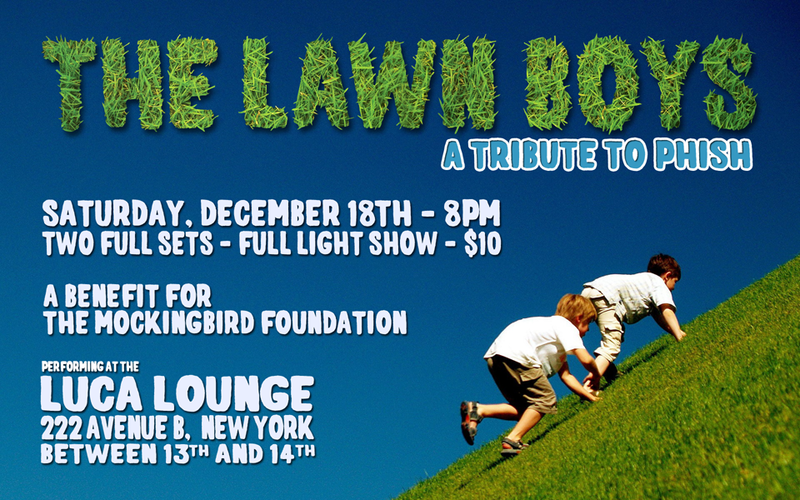 Lawn Boys – A Tribute to Phish will perform this Saturday, December 18th, to benefit the Mockingbird Foundation. Lawn Boys will play two full sets of Phish classics, with a full light show, at The Luca Lounge, 222 Avenue B (b/w 13th and 14th), New York, NY. Tickets $10, and 50% of the door goes to Mockingbird, to support music education for children. UPDATE: Due to a massive power outage last night at Luca Lounge, the show has been moved to Fontana's Bar, 105 Eldridge Street, New York, NY 10002-4482, (212) 334-6740. Enjoy the show! !